The owner of an island that will host educational programs says the task is trickier than you may think. Students at Monmouth Academy are competing to come up with the best design. 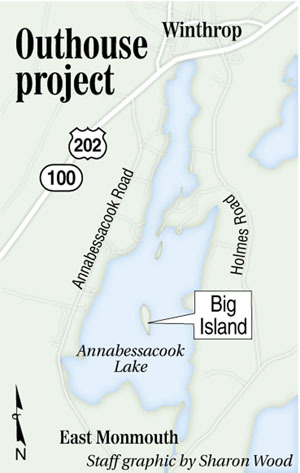 MONMOUTH — As Kent Ackley develops a camp and learning laboratory on an island in Annabessacook Lake, he wants everything to be as environment-friendly as possible. That extends to providing for the most basic needs of the people who will visit the island, including the elimination of human waste. Sixteen students in four teams are competing to design outhouses for the island. It’s the first of several projects in which Ackley hopes to engage Monmouth Academy students as part of One Big Sustainable Island, a new nonprofit organization that will operate educational programs on the 14-acre island that Ackley has purchased. Monmouth Academy Principal Rick Amero said school officials are happy to partner with Ackley, who graduated from the school in 1985. “There are just so many activities that could be available to our students, K through 12, and eventually, possibly for the whole district,” Amero said. One Big Sustainable Island will focus on environmental stewardship, alternative energy and personal wellness, and Ackley hopes to minimize the impact that the privies and other facilities will have on the island’s ecosystem. He gave the students a six-page packet of guidelines, a scoring rubric and contact information for experts and regulators. The students began working on the project in January and will present their proposals to a panel on Friday. Composting toilets make the most sense, sophomore Dylan Thombs said, but strict regulations apply. Sophomore Sabrina Beck said her team is also trying to figure out how to dispose of the resulting compost, because it seems they can’t keep it on the island. The competition fits into the proficiency-based model of education being implemented at Monmouth Academy and other schools in Regional School Unit 2, which also includes Dresden, Farmingdale, Hallowell and Richmond. In a proficiency-based system, students are evaluated on whether they meet specific skill and knowledge standards, but they have flexibility in the timing and the methods they use to demonstrate proficiency on those standards. The students working with One Big Sustainable Island are doing the project outside of class time, but they will be eligible for academic credit. Engineering technology, for example, is typically a junior year course, but Thombs is trying to fulfill several standards from the course in his sophomore year by showing that he can define a problem, devise multiple solutions and analyze the pros and cons to choose the best one. Once a design is approved, Monmouth Academy students will build the outhouses. Beck and sophomore Sarah Record said they appreciate the chance to work on something that will have an actual impact outside their school.